Yesterday, John McCain suspended his campaign, saying he was racing off to Washington shortly after his appearance at the Clinton Global Initiative at 8:45am to fix the financial crisis in America in a 4:00pm meeting with the president, House and Senate leaders and Obama at the White House. At 2:36pm, the senators all announced they had a deal. Shortly before 4:00pm, McCain went to the meeting at the White House and did what exactly? What could he possibly have done between the time he left the Clinton Global Initiative this morning in New York and 2:36pm in Washinton DC. Assuming he flew between the two cities, this man is a SuperSenator! Thank God for John McCain! I was settling in and almost asleep when some idiot on CNN was railing on and on about how this Clinton/Obama race is tearing the party apart, that it is bad for the Democrats, that they need to heal together to win the election in November. And, then as I hit that level of rage between annoyance at being kept awake and the dread of some human idiot won’t ever shut up, I got an epiphany! The job of President of the United States of America is held by one PERSON, not by a PARTY. Nobody cares about the Democratic Party any more. Americans want the best PERSON to win the election, even if the two people running against each other for the job are members of the same party! If anything comes of this, I hope it is the death of the two-party system. Against any of the two Hillary or Barack, McCain looks like a really, really old guy who can’t remember his name. But, Barack vs Hillary, that is a clash of Titans! THAT is a race to watch and people just don’t really want this one to end. I sure hope the loser of the Democratic primary runs as an independent. Either way, Hillary or Barack would win this thing, whether as an independent or a Democrat. Choke on that, Howard Dean! Ok, Colbert is on now… that’s a much quieter (boring) show and I’m curling up and taking a snooze. Now you can listen to the podcast in Rufus’ own voice.. really!! I recently had the opportunity to take a ride through Red State America along Hwy 35 through southern Ohio, West Virginia and onto Interstate 64. The ride was a bit odd as I emerged from Dayton, the rich, white, mall-laden Beavercreek into the hills, holler and trailer-park homes that lined 35 for miles upon miles. I listened to Obama’s speech again and again (we dogs have pretty good hearing) with his “bitter” and “cling” comments. In context, they make sense. Out of context, he sounds like an elitist. The same parts of America that will never vote for a [insert racial term here or use the term “black man”], that believe the unions are in their corner, that believe that when bad things happen, singing “God Bless America” will make things ok and when things go well, sing the praises of God and thank him are who need the message of hope the most. But they will reject it for things they “know” to be real. Guns, God and Government. Before you can change, before you can grow, before you can hope, you MUST start from a truth. The truth is that when the economy goes badly because our market shifts to making things in China instead of America, small towns who depend on a single source of manufacture are devastated. Lifestyles that were thought to be solid are disrupted. And people need to find a cause. Governments can’t be the cause, certainly you can’t blame God; that according to faith, would be despair, a deadly sin. Small town America struggles for understanding and “clings” to what it knows to be true. God is everlasting, omniscient and ever-present. Guns will protect you from someone else’s desperation. And government will bail you out with food stamps and medical care for your kids. That is the truth that this country NEEDS to accept for us to move forward. Instead, Clinton, FOX and other “thought leaders” pounce on these comments as elitist. They should be looking inward and asking themselves if perhaps Obama hasn’t driven along Hwy 35 in southern Ohio and West Virginia and looked out the windows more often than they have. You can’t pay your mortgage with HOPE, you can’t feed your children with HOPE. You can’t pray to HOPE. But HOPE is what will fuel a movement for change because hope — combined with the kind of desperation that is felt when things are as bad as they get — will cause people to change, to stand up, clinging to their guns and God and use that power for change. There is a reason God is in the First Amendment and Guns are in the Second. But, what do I know. I’m only a dog who only want to cling to walks three times a day, sniffing butts and checking out the cute puppy chicks on the corner. Is there a text in this election? Oh, brother. Why is this DNC nominating process so hard for the common people to grasp? And why is the misinformation being fueled by the press? I saw the same thing happening when Bill Clinton was being impeached. 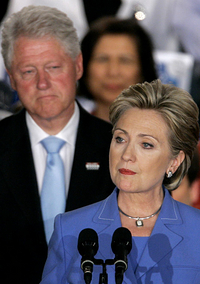 The “mob” saw Clinton’s impeachment as him being thrown out of office. But wait, the Senate actually gets to decide the ultimate fate?? Oh, that’s right, cooler heads are in charge. The New York Times ran an article by Stanley Fish that is just dead-on accurate about this whole process. My perspective from a dog’s point of view. This super delegate issue is a NOMINATION by a political party, not an election by the people. It is about picking someone who has the best chance of defeating the other party’s nominee. The GENERAL ELECTION is about which nominee would make the better president. Primaries and caucuses are “tests” to see how well each party-hopeful would fare in an election. It is a test-run, if you will. At the end of the day, the only “obligation” a superdelegate has is to the party and voting to nominate the candidate who has the better chance of winning in a general election. If you don’t agree with your party’s nomination rules, work with your party to change their rules. Or join another party. And, if you don’t like who your party puts up for nomination or who it nominates for the general election, vote for someone else. That choice is the part of the democracy that is ours.